Joey Barton has suggested former professionals should be involved in reviewing refereeing decisions. Nine league games into the season and Fleetwood Town are 10th in the table with just two defeats. 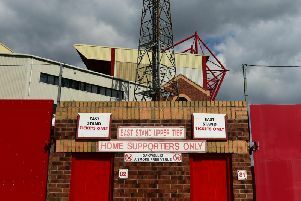 However, they are second bottom of the League One fair play table with 23 bookings and two red cards – a figure only topped by Charlton Athletic. They have three reds in league and cup with Cian Bolger’s Checkatrade Trophy dismissal seeing him join Wes Burns and James Wallace. The latter was dismissed for two yellows at Southend United last weekend with Burns shown a straight red for a foul during the win against Bradford City. Fleetwood appealed that dismissal but the original decision was upheld, a move that baffled Barton. He may have had 78 bookings and six red cards from his playing days in the Premier League but the Town boss believes that cards should not be dished out as frequently as they are. “Wes Burns is a bit unfortunate to serve his ban for a tackle he wins, then tries to pull his feet out of; the law of physics says you cannot really stop your momentum. “This is the problem when people who have not played football and have no idea about how football should be played rule on football. “It is why you should have people who have played the game, people who have experienced the warfare, judging what is going on. “You have got a lot of former players via the the PFA and stuff who are not in the game and not coaching who could well sit and advise on these commissions. “I get it if players have done things where they need to be suspended but let’s not get them off the pitch for petty stuff. Barton did, however, acknowledge that Town need to tighten up on cautions with Ash Hunter’s fifth booking of the season ruling him out against Barnsley on Saturday. He said: “I love Ash but some of the things he does are a little bit frustrating at times, certainly how he picks up yellow cards.